Blanketed by the lush jungle of the Riviera Maya, this ecological resort offers guests bungalow style accommodations in spectacular natural surroundings. 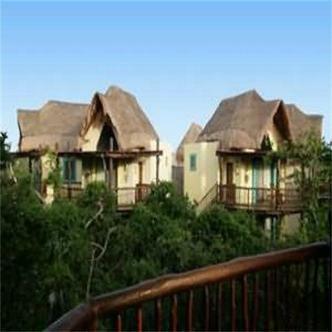 All 144 rooms feature a double Jacuzzi, a terraced balcony with hammock and 24 hr. room service. Enjoy two restaurants, a beach bar, eight massage/treatment rooms and a large outdoor pool with three distinctive sections for kids, teens and adults. Guests enjoy kayaking or snorkeling at the immaculate estuary, ecological tours and unlimited select tours to nearby interesting sites. There is plenty to do here for kids. The palapa entrance, shaped like a serpent leads you to an open-air mini zoo while the kids club offers children (ages 4-12) many activities and a refreshing wading pool.